This word originated in tropical Polynesia. 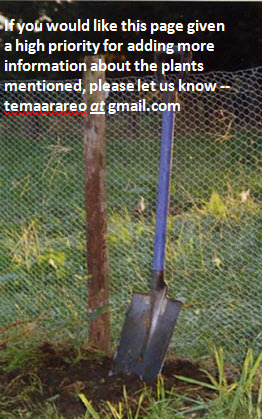 Rarotongan: Pirita (Dioscorea pentaphylla "Five-fingered yam", Dioscoreaceae; also Jasminium didymum, "Native Jasmine", Oleaceae); Pirita tūtae poaka "Finger-leaf yam [lit. pig turd yam]", Morinda myrtofolia (Rubiaceae). Maori: Pirita (Ripogonum scandens, "Supplejack", Ripogonaceae; also several species of mistletoe: Loranthus micranthus, Tupeia antarctica, Alepis flavida, Peraxilla colensoi, Loranthaceae). This word seems to have originated in Polynesia. Another, now more widely grown species of yam, Dioscorea alata, is denoted throughout Polynesia by words derived from Proto-Polynesian *Ufi. Watch this space! 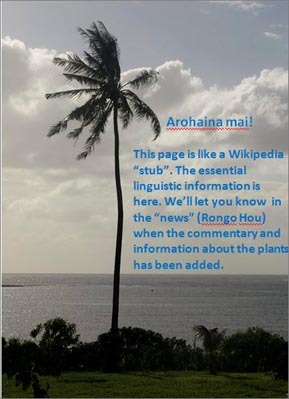 This is a page still very much under construction, but which contains the essential linguistic and botanical information, and to which both text and pictures will be added progressively as soon as time permits. See the first item on the "News" page for more information. The five-fingered yam was a "canoe plant" carried by the first Polynesians. As a food item it has been largely replaced by the purple yam, ufi (Dioscorea alata), also an early Polynesian introduction.